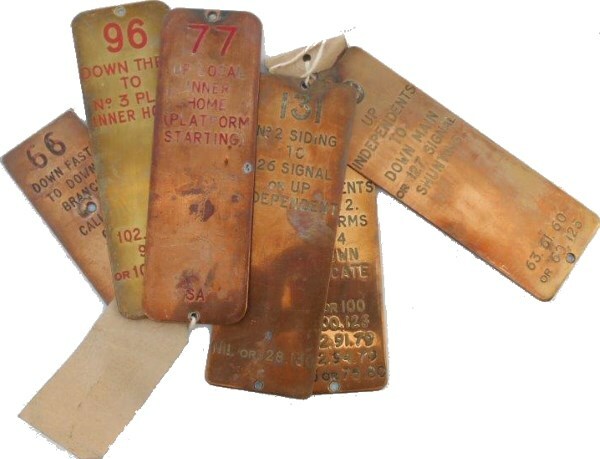 Lot 88 A Selection of six Midland Railway Copper & Brass Signalbox Lever Plates. 47 DOWN MAIN or TO DOWN INDEPENDENTS No1 or 2. PLATFORMS 2. 4 or DOWN DUPLICATE. 59 UP INDEPENDENTS TO DOWN MAIN or 127 SIGNAL SHUNTING. 131 No2 SIDING TO 126 SIGNAL or UP INDEPENDENT . 96 DOWN THRO TO No3 PLAT INNER HOME - (Brass). 77 UP LOCAL INNER HOME (PLATFORM STARTING) SA. 66 DOWN FAST TO DOWN BRANCH CALLING ON 70. All Good Condition.